We are delighted to announce the fourth annual TAROSOPHISTS awards. These are nominated and voted by many hundreds of tarot professionals worldwide, and represent the industry and profession in a diverse community. We would like to congratulate the winners this year and thank all our association members, volunteers, and staff for their engagement in what has been an illuminating year for Tarot. For constant and innovative tarot, lenormand and cartomantic creativity, including the revival of casting oracles over 2013 with the Magpie Charm Oracle. For a lifetime dedication to the art of tarot. For professional and common-sense delivery of tarot services in a unique environment. 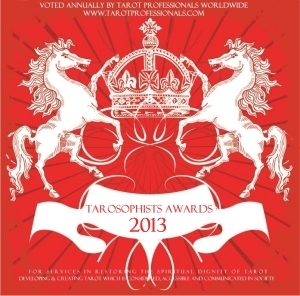 Voted by many for accessible and wide-ranging delivery of information on tarot and related subjects. la Biennale di Venezia/O.T.O./Warburg Institute for the Thoth Tarot art exhibition (9 original paintings), Venice, June 1st – November 4th. Congrats to all winners and nominees! AND thank you for bring dignity to tarot worldwide! An exciting year and now onward to 2014 for MORE adventures!